"In response, zookeepers gave the pair two eggs laid by an inexperienced first-time mother. 'We decided to give them two eggs from another couple whose hatching ability had been poor and they've turned out to be the best parents in the whole zoo,' said one of the keepers. 'It's very encouraging and if this works out well we will try to arrange for them to become real parents themselves with artificial insemination.' Wildlife experts at the park explain that despite being gay the three-year-old male birds are still driven by an urge to be fathers. 'One of the responsibilities of being a male adult is looking after the eggs. Despite the fact that they can't have eggs naturally, it does not take away their biological drive to be a parent,' said one." 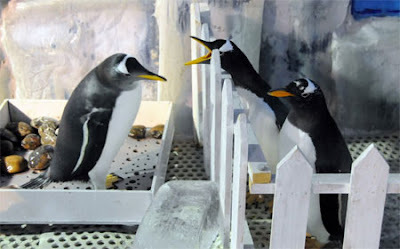 The photo is apparently the fenced-in gay penguin pair having an argument with a neighbor. Homosexuality occurs throughout the animal kingdom (for the unknowing among you, it is part of the gay agenda...as if!). I have always heard that penguins have a higher rate of homosexuality, but who knew they were also parental. And it looks like those 2 gay penguins are also bitchy! LOL But all kidding aside, I do love this story! So my story now is that the penguins at the top right of my blog, they are all gay! I may never watch another promo for Happy feet now without giggling! LOL....I bet it is more than just their feet that are happy! Penguins are so cute.